The Ballantrae Villages are located about 1.5 miles east of the Suncoast expressway in Land O Lakes. 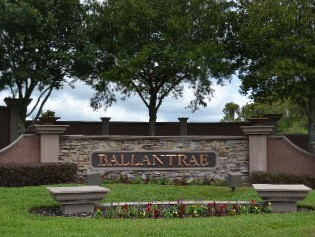 The Ballantrae Community is divided in 6 separate villages. As you enter, the townhomes at Straiton are located on the left. The other 5 villages are Ayrshire, Braemar, Cunningham, Castleway, & Lintower, which consist of single family homes from 1500 sq ft – 3600 sq ft. The Ballantrae community offers residents amenities such as a community pool, Children’s splash area, sand volleyball court, tennis courts, children’s playground, basketball courts, and open field. Residents of Ballantrae can also entertain guests and host events at the recreational center. Residents also enjoy walking around the lakes or strolling the sidewalks throughout the community. The homes in Ballantrae were built from 2005 -2008 by MI HOMES, Inland Homes, & KB Homes. Inland Homes only built in the Cunningham Village, & KB Homes only built in the Village of Lintower. Ballantrae is a great place to call home. This well maintained townhome is turnkey and ready for move in! Located in the very desirable community of Ballantrae, this townhome is perfect for first-time home buyers, those looking to downsize, or investors. It has a fresh coat of interior paint and features tile flooring, new laminate in the family room and new carpet throughout the second floor and loft. The kitchen has an abundance of storage space with beautiful rich dark wood cabinetry that's been upgraded with sliding shelves. The open floor plan allows the kitchen to overlook the dining room, as well as the family room, which is perfect for entertaining friends & family! The family room is pre-wired for surround sound. Amenities include a community center, two pools, tennis, volleyball and basketball courts. Conveniently located to schools, shopping, restaurants, Veterans Expressway and the airport. One or more photo(s) has been virtually staged Beautiful 2 bedroom 2.5 bath townhouse with attached 1 car garage in desirable Ballantrae Village! This unit backs up to a private wooded conservation area. Open floor plan with large kitchen, brand new stainless steel appliances, tile and laminate flooring throughout, no carpet. Second floor loft area is bonus space perfect for an office or reading area. Enjoy the community pool or the many amenities of Ballantrae Park nearby including walking trails, fishing pond, playground, basketball, volleyball and tennis courts, fitness center, playground, clubhouse and additional pool. Centrally located near the Veteran Expressway, I-75 and Wiregrass Mall with easy access to Tampa and the airport. 13; To help visualize this home's floorplan and to highlight its potential, virtual furnishings may have been added to photos found in this listing. All Information recorded in the MLS is intended to be accurate but cannot be guaranteed, buyer advised to verify. Sold As-Is. Amazing END unit townhome in the beautiful community of Ballantrae. This open and spacious floor plan has a large kitchen open dining area and family room on the main floor. The Kitchen features Corian countertops, tiled and nice Cabinets. A sought after split bedroom design has two bedrooms and a bath on one side of the loft and spacious master suite on the other to give maximum privacy to all. The large master bath includes a garden tub with separate walk-in shower and dual vanities. Also, Upstairs is a loft that can be used as a bonus room or office, plus washer and dryer storage area. The location of this home is close to the pool with the bonus of visitor parking just steps away. While the complex has its own separate pool, the Ballantrae community also has a pool, walking trails, fishing pond, tennis courts, basketball, playground and clubhouse. This location is close to the Veteran Expressway with easy access to Tampa, airport, Multiple Malls and the Premier outlet. The HOA $195 includes ground maintenance, trash, water, sewer and basic tv cable. Bldg exterior maintenance. Conventional or Cash! 13; 13; Will not Last!!! !